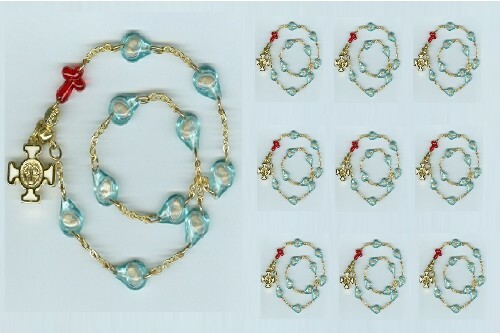 Rosary of the Unborn Bracelet Double-Wrap (Medium 10 Pack (with SPANISH Paper Booklets). 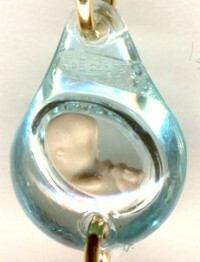 The Rosary of the Unborn Bracelet sold in bulk package of 10 (ten). Each Rosary is packaged individually with its own paper book in the Spanish language (Our Lady Gives the World the Rosary of the Unborn, The Revelation of Our United Hearts). The bracelet version of The Rosary of the Unborn, this beautiful double wrap bracelet holds all of the same graces as the Large and Small versions as revealed by The Blessed Mother. The bracelet has been developed so it can be worn for convenience and to encourage us to pray The Rosary of the Unborn at any time. The Rosary bracelet wraps around the wrist twice and then is secured by a magnetic clasp. Saint Benedict cross which protects against evil. Purchase includes free "Our Lady Gives the World the Rosary of the Unborn" PAPER booklet in the SPANISH language.